in many of these cases, we have people who are lonely, neglected, and they want people to notice them, in a sort of 'fear me' way. this is not really that effective. we all know magic works in the ways of sending out the energy to the universe which has an effect. in the case of certain types of magic it has a very high percentage in chance of the spell causing a backfire, which is incredibly nasty, this can include an extreme amount of physical pain or something a whole lot worse. personally i dont do magic for harm, personal gain or profit. if i were to help someone with, say.. a luck spell or a prosperity spell, i would do it if i know the person is in dire need and suffering a great deal, and especially if the person does not ask for it themselves, this way, i do not fall for people who want me to do magic for them just because they know i am a witch, and therefore they cannot use me. black magic is not like it is in movies. in reaity it is a very fragile type of magic, because love wins over hate no matter what. the weakness is shown though in a situation that you argue with a fellow witch, and they get mad at you for some reason, and threated to curse you. at this, it is best to laugh, because if you have strong faith and the right items, then you have nothing to fear whatsoever. and these items are very easy to get, i like recommending supplies that are easy to get, because i myself live in a country where witchcraft supplies are almost impossible. it can be noticed in many ways, like with me for example, i did a curse breaking but i also did a binding on the person who cursed that couple i helped, which i shouldn't have done, because at that very time he was stronger than me and had more faith than me, so he sent the binding back in the form of a curse, i started feeling depressed, i felt like i was being watched, like he was inside my head, planting things, and then i got the major hint, i was in my bedroom and going to sleep, when i heard a lot of strange sounds in there with me, while at the same time feeling like i wasn't alone, like there was someone in there watching me. it took awhile before i removed the curse, but by then it had taken complete hold of me, causing a lot of pain and trouble. you can also notice it by having a lot of bad luck, not just bad luck but a whole load of it, things going wrong all the time, several bad things happening at the same time. it all depends on if you have pissed off someone who is a witch, life can be hard, some have a harder life than others, i know that personally. people don't curse with no cause, anger them and it can happen. I personally love Luisa Teish's discussion of curses, hexes, and the like in Jambalaya. Very informative, great advice. And I never use the term black magic, because I was taught it was offensive to use. All the dark goddesses, gods, and darkness and blackness being an important part of most Pagan paths and all...so I use the term 'malefic' magic instead. Most practitioners will tell you: look within before looking without. Some people are eager to blame others for curses when things go wrong in their life, when in reality it can be your own magic working against you because of the way you are thinking (demeaning thoughts that manifest in your life, hurtful patterns you have fallen into, etc). Whenever I feel threatened I say a quick blessing prayer, perform a cleansing if I have time, and then go on my way. Another way to defend yourself is to summon a defender, in this case a Sumerian spirit (Extremely effective). Look through one of my posts an you'll find a darn good defender for this kinda stuff. A long while ago (give or take 5 years ago), I had so much bad luck an negative energy flowing around me that it was a wonder that a piano didn't fall from the sky to end me. Every single day (without fail), after taking a shower I would always accidently ram my toe in the corner of my metal bed frame, I always had to change my uniforms twice a day before going to work (something would always get on & it would be very noticable), and regardless if I left for an hour or 3 hours early, I would always (somehow) be late. Then a bad luck day came along that confirmed my suspicion: I get off work, I miss the buss an I chase it on my bike at full speed for a mile uphill an it still got away. I finally arrive at the Transit Center (where tons of busses arrive an sit for a while) to find that the buss is taking off so I rush right infront of it (yeah not smart), an luckily he stops an lets me load my bike. As I'm loading my bike, the rack takes a chunk of skin off me, then after I'm done I rush it (not watching where I'm going), I trip at the curb which sends me flying head first into a woman's private area (obviously she wasn't happy), I get off her an attempt to get on the buss, but trip on my way in nearly falling on the buss driver. The buss driver witnessed it all an his reaction is, "Don't touch me, you have serious bad mojo hovering over you", then he drops me off at my stop, I try to get my bike off the rack, it gets me again, an then I lose my grip which causes it to fall on my foot - facepalm from the buss driver lol. So, I checked around for a way to get rid of the truly annoying bad luck that just won't calm down (oh yeah, every day I'd also wake up with cuts on my body with no prior knowledge of how I got them). After weeks of searching through the bull, I finally found one that sounded like it could do the trick. After the ritual, the summoning, an all that rather difficult focusing (ever felt extremely light headed when doing a spell or ritual, thats what happened with me), I finally got it finished an waited for a sign (if it was the real deal or if I wasted my time), an sure enough, not one single day of bad luck for a couple years !! So, seriously, if you have overwhelming bad luck with a side of heavy negative energy looming over your head - Seek out the Sumerian Spirit TUKU! Side note, reason why it only lasted a couple years is because the sigil I was suppose to keep on me an not show to anyone, couple years after I did the summon I stupidly threw it away thinking I didn't need Tuku's help any longer - few weeks later, I lost my job, clearly not the best idea lol. So if you do summon Tuku, remember to keep the sigil on you at ALL TIMES an NEVER show it to anyone (it somehow loses it's power if shown to someone), and it is always best done (the ritual) on a full moon at 3:00 am in an absolute silent spot. Do this Gaia, by the time you feel Tuku's protection an everything starts getting better, you'll wish that you would've known about Tuku sooner. So in reading this quite interesting thread, I had really no idea what you are talking about in reference to your 'sigil'. Gotta LOVE Google lol. A great Explanation on Sigils. Pretty cool... though I have to ask why you felt you had to carry it on your body all the time (sleeping/bathing/etc?) when the document I posted above said for it to work properly, the sigil itself has to be 'forgotten' by the conscious mind. This seems to be a slightly bit contradictory to me? Especially when some of the recommendations on how to actually 'charge' the sigil suggest things like using fade away ink, painting it on your body then letting it wash off in a bath, things where it is tangible then through some transformation, becomes intangible. faraetaildreams wrote: So in reading this quite interesting thread, I had really no idea what you are talking about in reference to your 'sigil'. Gotta LOVE Google lol. The link to the doc you posted would be contradictory to mine provided they were both written or typed by the same author/person. He says it needs to be simply forgotten by the conscious mind (which honestly makes zero sense - you are either aware of something or you're not, just like ghosts, you can't out of nowhere pretend that they aren't there), but the person that wrote about the sigils I was mentioning says that you have to keep it on you (but of course not while you're bathing, dunno how you'd be able to do that an not ruin the sigil). 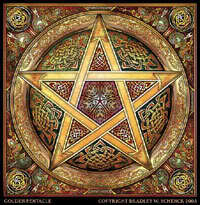 Charging a sigil or seal though, that is up to the practitioner unless there is a particular method to get it right. Recommendations are just suggestions, not a must - so if this person suggests this or that, check it up an see if it works, or if it makes no sense to do it that way, choose your own. The precise method of to do this or that are things you should follow; directions. Recommendations/Suggestions is just through their experience an is not considered mandatory for the ritual/spell, but is optional. And one more thing, My sigil/symbol is my avatar picture, but the sigil I mentioned in my previous post is a Sumerian Spirit's Sigil - felt I needed to mention that since you said "your sigil" an not "Tuku's Sigil". i just performed the TUKU ritual, however I performed it twice for good measure and for the fact that I studdered while saying his summoning word the first time. I'm just concerned if performing it twice in a row on the same night will ruin the ritual. i read you shouldn't perform the same ritual three nights in a row so im hoping this wont interfere with what I'm trying to achieve. if anyone could shed some light on this, it would be greatly appreciated. I'm new to this kind of stuff, I just want to make sure I'm doing it right. i just dont understand why so many have the need for such complex rituals and so on, the more simple is a lot more powerful than people think, i do things the easy way, in the old days, it was all so different than what people think it is, and far from what most want to believe... truth is they did things simple, they never gathered either, because they lived far away from others where it was safer for them to live, real witches are very lonely people. the simplest magic is the most powerful, thats why i knew wicca wasn't right for me whatsoever, for many reasons, but a lot of it was because things aren't like people say in reality. there is no circle needed to do magic work, that i know because i never used one, nor will i ever. Do you someone (genuine and will do for free) something to remove it ? do you guys think this is a valid site ?